As I’ve mentioned in some of my earlier posts I’m a huge fan of Formula 1. It all began when I was a kid with cheering for Mika Hakkinen and then went on with Kimi Räikkönen who still is my number one favorite even though Sweden since last year has got its first driver since the early 90’s. So, when I one day in March 2011 came across an old Tag Heuer ad with Kimi wearing a Tag Heuer watch from the days in McLaren-Mercedes, I figured “hmm… I wonder how much these cost today”. I did some quick searches at my usual spots and found a used one in France. Full set in decent condition. On the product images from Tag Heuer it looked really nice. In reality not so much. But I did like the bracelet and the rubber details. 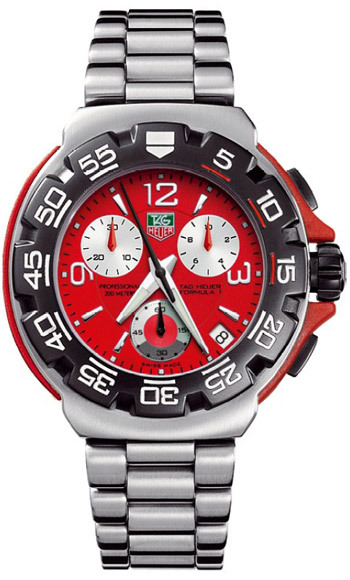 #68 - The Tag Heuer F1 ref. CAC1112 with Kimi's ad in the background. When the watch arrived it was dead. The bracelet was also way too short. I contacted a local Tag Heuer AD in Stockholm and paid about $80 for a battery replacement, pressure test and two link pieces. Felt like pretty reasonable deal to me. I can’t say I wore it very much. I like quartz watches but I’m not much of a chronograph guy. It went out for sale on my local watch forum. Not one single answer for weeks. Finally I put it up for sale on a more commercial site and it disappeared quite quickly. I remember it was a dad who bought it for his son’s graduation and he really wanted a Tag Heuer F1 chronograph. Some people hate Tag Heuer. I’ve owned a few by now and I must say I’ve started to like them more and more over time. The resale value is really bad so if you have decided to get a Tag Heuer make sure to look for it used and you can end up making a really good deal.